Many times I refer to virgin old growth cypress, or recovered, as reclaimed when in fact that’s not entirely correct. I use that term to simplify the wording as most people know what reclaimed means but not recovered . Recovered cypress means its salvaged timber that was never used but pulled from the swamps, rivers and lakes of Florida where it lay for over a hundred years after it sank (sinker cypress) as it floated in large log rafts to the mill. Reclaimed cypress is cypress used for some purpose in the past and salvaged when that use becomes obsolete. Generally, when someone wants reclaimed cypress they expect it to be from virgin old growth trees, but reclaimed could be from any source if it is salvaged. Interestedly, I been told most of the virgin old growth cypress harvested at the turn of the last century went to Europe. Here in the U.S. it went to the Northeastern states and was used by the Railroads everywhere to make water tanks for steam locomotives. These are good examples of reclaimed cypress if salvaged. To date all my virgin old growth cypress is recovered , never used and lay as it sank or fell at the bottom of a sandy Florida river bottom or in some remote swamp until salvaged and sawed. Generally, recovered cypress is more beautiful than reclaimed because over all those years submerged the logs take in minerals and produce some amazing colors and figure . Some of these logs are extremely valuable costing thousands of dollars before they are sawed up. Recovered cypress lumber is highly sought after by architects and craftsman. I will continue to use the terms reclaimed cypress or old growth cypress because most people can relate to that term. Recovered is more an industry term and not widely used by general public but all my clients know what they are buying from me whether recovered cypress or reclaimed cypress. Remember when I mentioned most people expect reclaimed to be old? Be very careful when paying big dollars for so called reclaimed because even young trees can be harvested , sawed and used then salvaged and called reclaimed. How do you know for certain that so called “reclaimed wood” table you want, or bought, that is made overseas is really old reclaimed wood? 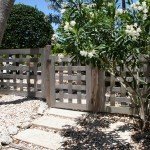 Trust American craftsman to do the right thing..
Several years ago I was asked to make a Wiederweave ™ fence and gate using my reclaimed cypress. 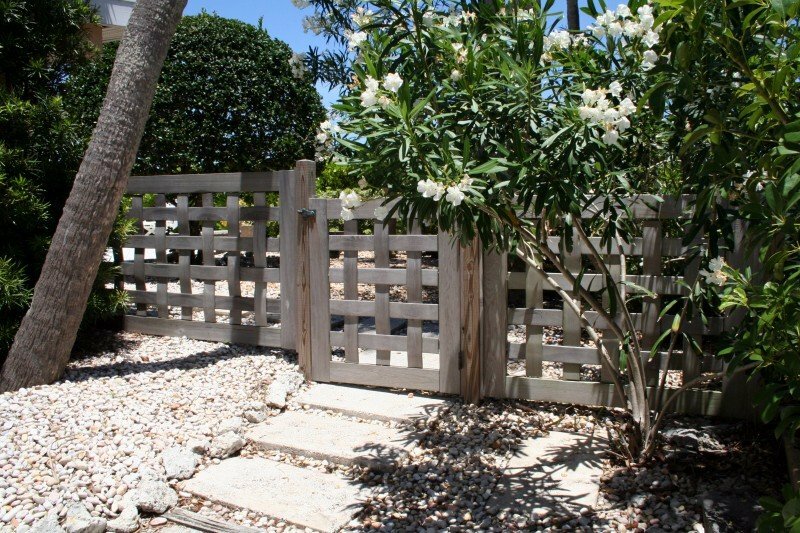 This cypress fence and gate was placed in one of the most harsh areas of Anna Maria Island , Florida probably in all of Manatee County. Florida. It is approximately 100 feet off the southern end of Tampa Bay at the very north end of the island. It is well known for the ferocity of the winds that blow from Tampa Bay especially in the winter months. In addition to the winds since this is so close to the water the high humidly and salt air wrecks havoc on wood or anything else for that matter. Its been a few years since I inspected my creation and wondered how well it had held up in such a hostile location. The client and I intentionally selected a design that would handle the winds. The client did not want the fence or garden gate sealed but allowed to weather naturally which I was a little apprehensive about being in such a nasty area for wood. As you can see by this recent photo the fence and garden gate turned a beautiful silver /grey . Generally only pure heartwood from any wood specious will weather to uniform silver/grey. If there is sapwood present it usually will develop mold if not treated or sealed. The posts are P.T. pine . Back then that’s what I did but now I use cypress posts in the ground with proven preservation techniques. The fence and garden gate are performing beyond my expectations and my client is extremely happy with the investment.